"Runner's Jewelry, Personalized Runner's Ring in Silver, Double"
Be proud of the athlete you are and the accomplishments you have acheived with our Runners Ring! 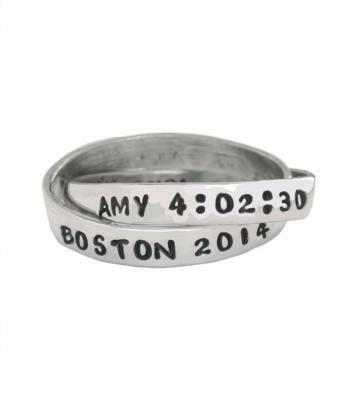 This double ring can be personalized to make a gift for you or the runner in your life! Celebrate your achievements in classic style with our simple stamped silver runners ring. This listing is for the double ring but you can also choose a single or triple band ring. Customize each band with your best time, inspiration word(s), your name or the race name...whatever would celebrate your love of the sport! Because the ring is customized all sales are final.